Imagine telling some one that Amelia Earhart, the First Lady of Flight, crashed on your family farm! Well, she didn’t exactly crash, and it wasn’t exactly our family’s farm, anymore, but the historical account is worth repeating. This is just one of the real life stories we’ll share in this introduction to our McRoberts family of Western Pennsylvania. One must go back many generations in our family to reach the McRoberts clan. I first discovered that I was related to these Pennsylvania pioneers while reading the genealogical message boards over a Christmas holiday break. At the time I was searching for the ancestors of my fraternal Great grandmother Permelia Nelson Pearce (1839-1914). Several Pittsburgh area researchers (1) revealed that my great-great grandma was also named Permelia, only her name was pronounced as the British would say. “Pamelia.” She was the daughter of George Allison (1775-1837) and Susannah McRoberts (1775-1854), the first McRoberts we can be absolutely certain of at the time of this report. Believe me, there are a few others in Allegheny County, many with similar first names. After a look at the meaning of the surname, the origins of the ancient kin, and at least one famous McRoberts, we’ll consider our possible connection to several other McRoberts in the early Pittsburgh area. We’ll even throw in an amazing coincidence for good measure. The McRoberts surname is obviously a derivation of the first name “Robert.” As we’ll learn, some spell it MacRoberts, and both strike of old Scotland and Ireland. The prefixes both mean “son of.” YahooAnswers.com says that there’s no difference, and they may be used interchangeably. Another variation of the name is Robertson, whose clan history we’ll look at in a minute. I’m especially fond of the name “Robert” because it was the name of my mother’s grandfather, Robert Patterson Gray. Although he was Scots-Irish to the core, his first name probably originated with the old Germans, meaning literally, “Bright fame,” according to Behindthename.com. With some 30 variants, the name was brought to the British Isles by the Normans and soon replaced the English cognate “Hreodbeorht.” Since the 14th century heroics of liberator Robert the Bruce, the name has been a favorite with all who call Scotland their ancestral homeland. When was the “Mc” added? 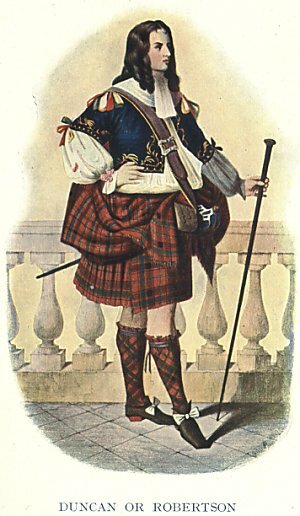 No one knows for certain, but it is believed that the name McRoberts followed Robertson, which was a sept, or an ancient marital connection of the MacDonald clan. This Robert was noted for his predatory incursions into the Lowlands, and is historically known as the chief who arrested and delivered up to the vengence of the government Robert Graham and the Master of Athole, two of the murderers of James I, for which he was rewarded with a crown charter, dates in 1451, erecting his whole lands into a free barony. Other theories align the name more closely with the success and popularity of the previously mentioned Robert the Bruce (Battle of Bannockburn, 1314). Scottish history is filled with Roberts, whose conquests and defeats, military and otherwise, make great reading. The most famous American McRoberts was Samuel (1799-1843), the esteemed U.S. Senator from Illinois, whose Kentucky ancestors are thoroughly documented. We’ll skip any additional review of famous Roberts, Robertsons, and McRoberts in the interest of time and space, keeping in mind the many variations on the name. Instead, we jump to the entrance of McRoberts into colonial America and, later specifically, Western Pennsylvania. The McRoberts family of Fairhaven, Mifflin Township, PA (2), can be traced to Scotland with James McRoberts (b. abt. 1755). He crossed the ocean with the British army. Tradition says that he traded sides to join Washington’s troops at his “first opportunity,” never returning to his homeland. After the Revolution he obtained a large tract of land in Lancaster County, where he married, raised six children, and eventually died. Son James, Jr. journeyed west in 1799 and served as Mifflin Township, Allegheny County, J. P. for 42 years (3). His brother John (1806-1891) followed and began a blacksmithing business nearby. Their widowed mother brought the remains of the family sometime later and purchased a 100-acre tract next door to John for $1.25 an acre. John and wife Eleanor produced 8 children. The life of John possibly provides our connection to this pioneer family because, as Jordan’s history says, “He learned the blacksmithing trade from his uncle, Henry Baird,” perhaps the brother of whom we believe to be our McRoberts matriarch, Hannah Baird (b. abt. 1750)(4). This means that perhaps the Scottish-born Pennsylvania pioneer James McRoberts of Lancaster is the brother of our Hannah’s husband, William McRoberts (b. abt. 1750), who probably settled somewhere north of the Allegheny River (5). If GenForum contributor Jim Bruce is correct, two of John’s daughters married into our Allison family (6), for whom the North Pittsburgh suburb of Allison Park is named. We hope that additional research will confirm this family connection. We don’t know the exact relationship between the North Hills and the South Hills McRoberts, except for one amazing fact, which we shall consider now. Mifflin Township is perhaps best know as the home of the Allegheny County Airport, opened in the 1931 and serviced one million passengers a year until the Greater Pittsburgh International Airport in spaceous Moon and Findlay Townships was developed in the 1950s. Is there a coincidence that one of the northern McRoberts’ farms in Fox Chapel (7) was taken for Pittsburgh’s first municipal airport, Rodgers Field, and the southern McRoberts’ homestead is in such close proximity to the present day County Airport? As of this writing, we can only say that the early McRoberts must have had an eye for large, flat, open spaces, ideal for farming and aviation. Let’s look more closely at the land to the north, just across the Monongehela and Allegheny Rivers and, while we’re at it, hear about a celebrity who happened to “drop in” on a former family farm. Frances Hardie’s excellent history of Fox Chapel, Allegheny County, PA, contains references to several pioneer families who were our ancestors: Crawford, Campbell, and yes, McRoberts. In locating the farmsteads of the first two on a 1931 map of the district, I stumbled upon their large farms adjacent to both the Golf Club and High School in what is now the Borough of Fox Chapel. I learned that a portion of one of the McRoberts’ farms was acquired for about $10,000 in 1925 through the right of eminent domain, or as Hardie calls it, “condemnation.” The establishment of Pittsburgh’s first municipal airport didn’t happen without a “hitch,” though, as the acquisition of the 40-acre site took court action and two years. Later known as Rodgers Field, the spot is where John Kowalski made the very first recorded flight in the Pittsburgh area in 1910 (8). According to a publication by the Pittsburgh Chamber of Commerce, anyone objecting to the conversion of prime farmland to airstrip was called an “obstructionist.” Aside from the backing of the Chamber, the progressive Pittsburgh Aero Club had some 300 members, many of them wealthy industrialists. It’s not known the political position the McRoberts took, although our Campbells had been avid supporters of officially establishing Fox Chapel Borough. The upgrading of the farmland to what was then considered “modern aircraft readiness” involved only a single piece of power equipment, a steamshovel. The rest of the leveling was done by about 100 mules, four at a time, dragging scoops, . They were kept under a rented circus tent for several months as the work proceeded. That must have been some sight, and smell. The new airfield became a training base for the growing U.S Army Air Corps and a terminal for limited commercial and recreational flights. However, after many complaints from residents, farmers, and golfers about low flying, noisy, and downright dangerous aircraft, the Allegheny County Commissioners accepted a resolution by the Fox Chapel District Association to close Rodgers Field in 1935, only 10 years after its official beginning. No doubt, some of our cousins who remained in O’hara Township and Fox Chapel Borough through those years and witnessed those exciting early days of aviation in person have additional stories to tell. At this time we don’t know what became of either of the McRoberts familes, except that several of the northerners are buried in nearby cemeteries, including the Henderson Cemetery where Grace B. McRoberts (1857-1926) was a director of the Harmarville Cemetery Association. She was the sister of Charles and the daughter of James McRoberts III (1825-1903). Future research should determine more exact family relationships and more. As this article is posted, we await the arrival of a new 2008 publication by the O’Hara Township History Committee, Portrait of an American Community: O’Hara Township, Our friends at the Fox Chapel library assure us that more about the pioneering McRoberts Family is referenced there. Stay tuned. 2. This location near Baldwin Borough, perhaps historically at least, is now best known for its coal mine. 3. The 1914 Warrantee Atlas of what is now Jefferson Township, Allegheny County, shows a transfer of the 422-acre parcel patented as “Fellowship” in 1786 by William Elliot to James McRoberts and Andrew Finney in 1817. 4. Another of blacksmith John McRoberts’ Baird uncles is listed in the book as a minister, Rev. Thomas Baird. 5. William McRoberts (PA Pvt. PS) is listed as “A Patriot of the American Revolution” at http://www.monc.michdar.net/patriots, the site of the Trenton, MI, Sons and Daughters of the American Revolution. The story of Pittsburgh-born William McRoberts, Jr. (1856- ) may be found at Googlebooks.com , p. 376. Another Western PA William McRoberts, of Washington County, married into the Mellon family and is at http://www.watermellon-kid.com. 6. Bruce lists his John McRoberts’ life span as “ca. 1754-1834,” the birth being perhaps a generation too early. 7. The 1902 Pittsburgh Legal Journal tells a tragic story of James F. McRoberts, Sr.’ three O’hara Township farms being awarded to offspring James, Jr., John, Samuel, and Mary in settlement of a divorce proceeding that apparently involved some spousal abuse. The father died a decade later and is buried in the Greenwood Cemetery. 8. Rodgers Field was named after Calbraith Perry Rodgers, the first aviator to fly coast to coast. Built in Pittsburgh, his plane was shipped to New York by rail the following year. The daring young pilot reached Long Beach, CA, in only 49 days at an airspeed averaging 52 miles per hour. Rodgers lived through 69 landings, 15 of them involving crashes of some sort or another. Amazingly, he limped away from his airplane, the Vin Fiz, with two broken legs. 10. For pictures of Earhart’s several days at Rodgers Field, Fox Chapel, see Hardies, p. 93. Jordan, John W. Ed. Genealogical and Personal History of Western PA. Vol. 3. I believe I am one of the McRoberts of Allegheny county. I’m very glad to hear from you. Would you mind giving me some more background information on your line, especially back to William, Hannah, and Susannah? You may use my personal e-mail address if you wish: Pearce@atlanticbb.net .